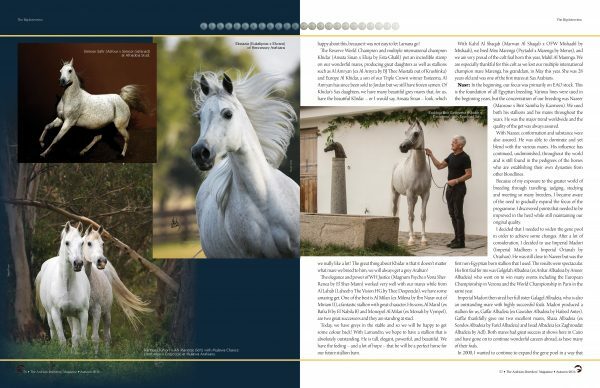 First printed in The Arabian Breeders’ Magazine Volume I Issue I September 2016. Please enjoy this interview with the late Nasr Marei. Nasr: November 2015 marked a major milestone for Albadeia Stud here in Cairo, Egypt. It was the 80th anniversary of our breeding programme, something that, through the turbulent history of those years, is an accomplishment of which I am proud as well as being extremely grateful. 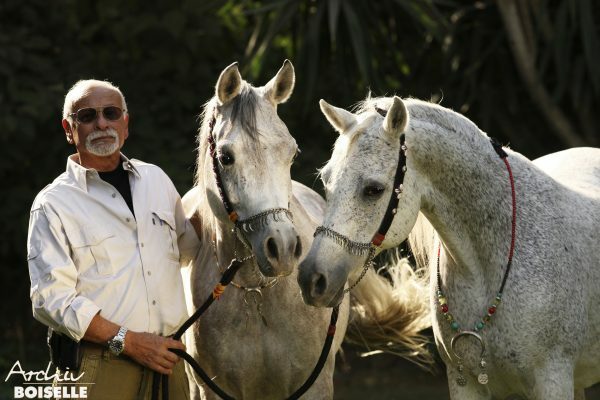 Horses and breeding have been a family tradition since the time of my grandfather, Ahmed Marei. In 1935, he began our programme with the purchase of two daughters of Ibn Radwan (Radban El Azrak x Bint Gamila by Ibn Nadra): Bint Magboura (ex Magboura by Gamil Manial) and Bint Bint Bint Riyala (ex Bint Bint Riyala by Gamil Manial), from the Royal Agricultural Society (RAS). In the mid 1940s, my father, Sayed Marei, began to seriously expand the breeding programme. He used horses from the RAS, later known as the Egyptian Agricultural Organization (EAO). These horses were used along with other bloodlines that were being used successfully by other programmes including Ihshass and some of the private farms. Gradually, a core began to form of what would become known as the Albadeia horse. As the Albadeia horse became identifiable and recognised for careful breeding selections, some of the foundation mares were bought by breeders in North America and throughout Europe. They formed the foundation of many breeding programmes worldwide and can often be seen in the pedigrees of World Champion horses. My brother Hassan and I were involved with my father throughout the years because the Egyptian horse was in our blood. When our father passed away in 1993, we took over the programme. Eventually, I assumed full responsibility for the breeding decisions while always relying on Hassan for his input and advice. In the 1990s, the EAO began to hold National Shows. This opened up the Arabian world in Egypt to a whole range of possibilities. Albadeia became the most successful stud farm in these competitions. Our horses won the great majority of the championships throughout the years, even when the competitions became international in scope. 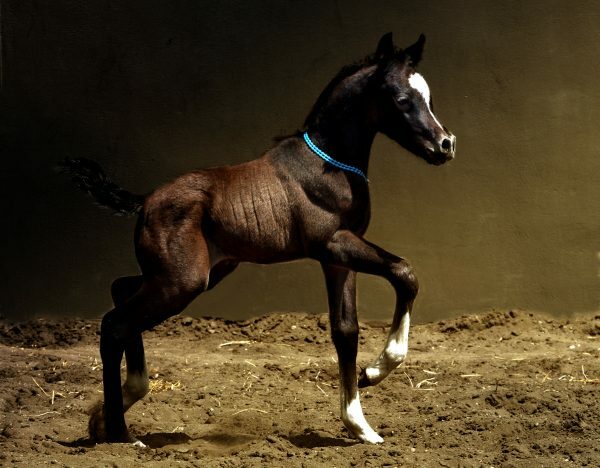 Dahoom Albadeia (Farid Albadeia x Simeon Safir). Credit Nasr. Nasr: In the beginning, our focus was primarily on EAO stock. This is the foundation of all Egyptian breeding. Various lines were used in the beginning years, but the concentration of our breeding was Nazeer (Mansour x Bint Samiha by Kazmeen). We used both his stallions and his mares throughout the years. He was the major trend worldwide and the quality of the get was always assured. With Nazeer, conformation and substance were also assured. He was able to dominate and yet blend with the various mares. His influence has continued, undiminished, throughout the world and is still found in the pedigrees of the horses who are establishing their own dynasties from other bloodlines. Because of my exposure to the greater world of breeding through travelling, judging, studying and meeting so many breeders, I became aware of the need to gradually expand the focus of the programme. I discovered points that needed to be improved in the herd while still maintaining our original quality. I decided that I needed to widen the gene pool in order to achieve some changes. After a lot of consideration, I decided to use Imperial Madori (Imperial Madheen x Imperial Orianah by Orashan). He was still close to Nazeer but was the first non-Egyptian born stallion that I used. The results were spectacular. His first foal for me was Gelgelah Albadeia (ex Anhar Albadeia by Ameer Albadeia) who went on to win many events including the European Championship in Verona and the World Championship in Paris in the same year. Imperial Madori then sired her full sister Galagel Albadeia, who is also an outstanding mare with highly successful foals. Madori produced a stallion for us, Gaffar Albadeia (ex Gawaher Albadeia by Hafeed Anter). Gaffar thankfully gave me two excellent mares, Shaza Albadeia (ex Sondos Albadeia by Farid Albadeia) and Issad Albadeia (ex Zaghroudat Albadeia by Adl). Both mares had great success at shows here in Cairo and have gone on to continue wonderful careers abroad, as have many of their foals. In 2000, I wanted to continue to expand the gene pool in a way that would improve certain aspects of my horses. My decision was to buy Simeon Sharav, by the great Asfour (Malik x Hanan by Alaa El Din) and out of Simeon Shuala (Simeon Shai x Ramses Tinah by Ramses Fayek). I had solid bodies and legs but wanted to improve the croup and add to movement. I also wanted the upright neck and shoulder that I believed he would contribute. Sharav did, in fact, accomplish this and added his small ears and pretty eyes. There is a definite Sharav stamp to all of his get, as he nicks well with various mare lines. They are instantly recognisable. They have gone on to carry the Albadeia name throughout Europe and the Middle East. Another positive trait is that they all possess is a wonderful disposition. Around the same time, in the late 1990s, I bought Bar Sama Halim by Ansata Ibn Halima (Nazeer x Halima by Sheikh Al Arab) out of Bint Albadeia (Hassan x Noose by Ibn Maisa). This gave me the Ibn Halima blood along with returning some of our original blood to the farm. He made a change but did nothing drastic while producing some excellent mares. Haytham Albadeia (Simeon Sharav x Galagel Albadeia). Credit Nasr. Nasr: My goals have been the same since the beginning. It is always to breed a better horse. My approach to doing this has evolved through the years. I continuously challenge myself as a breeder by trying to apply what I have learned. My eye as an artist contributes to this process. I am always critical of my own horses. I look at them, and judge their strength and weakness. Then I try to determine how I can correct whatever I may feel needs adjusting. One must always be realistic in evaluating his own horse. 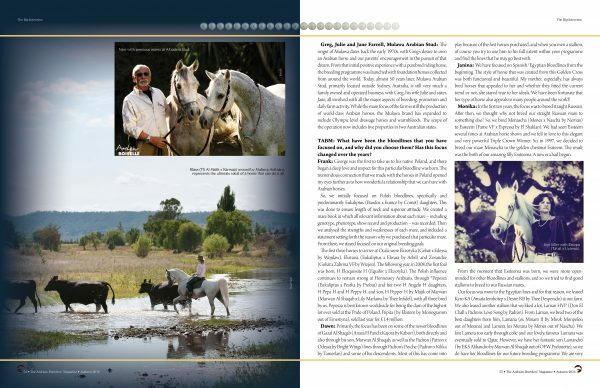 I try to bring all the understanding that I have gained during this long period of involvement with the Arabian horse. My goal is primarily to improve my horses. Bringing championships is not what I work towards. Many of my horses would be ideal representatives in the show-ring, but they do not compete. However, they are important in continuing what I am trying to do. Expanding my gene pool was a major decision but I believed it was necessary and I have been gratified by the results. The important thing is not to allow either the breeder’s eye or the artist’s eye to dominate. Both must be combined to achieve what you are aiming for. At this point, based on what I learned and observed abroad, I continued to expand my gene pool by going even further from the Albadeia lines. I leased Majd Al Rayyan (Safir x Ansata Nawarra by Prince Fa Moniet). He was bred to a number of my mares and was able to deliver what I was hoping for from him, especially beautiful heads. A most important period in my programme was when I leased Laheeb, the Imperial Imdal (Ansata Imperial x Dalia by Morafic) son out of AK Lateefa (Ibn Moniet El Nefous x Siralima by Ansata Ibn Halima). He has been what I have referred to for years as my idea of ‘the complete horse’. I felt that he could add significantly to my mares and, I must say, he fulfilled many dreams. He was bred to fourteen mares and gave a lot of his superb conformation and disposition to the foals. ‘Harmony’ is the word I would use to describe Laheeb. So much about him was right. Currently, Bariq Al Shaqab (Al Adeed Al Shaqab x Wahayeb Al Shaqab by Ansata Selman) is standing at my farm. He will be with us through 2017. His first foal crop has just started to arrive, with three foals being born the same night. Eighteen more mares are in foal to him. I am hoping that he will improve some heads and complete bodies. I also bought two beautiful mares who have added wonderfully to the programme: Simeon Safir (Asfour x Simeon Safanad by Sankt Georg) and Ansata Majeeda (Ansata Hejazi x Dal Maharia by Dalul). Both mares continue their extraordinary grace and classic looks as they become long-time residents at our farm. Nasr: If we are referring to the period since I took the reins in the early 90s, I would have to say that Farid Albadeia will always hold a most special place in my heart. He was the son of Ameer Albadeia (Kayed x Malekat El Gamal by Waseem). They were the original foundation sires of our programme. Farid Albadeia’s dam was the exquisite Farida (Fayek x Nagdia by Nazeer). These horses were the cornerstone of our farm. The other shining memory for me was to have bred Gelgelah Albadeia, who was one of the most beautiful mares we ever had. I have had many wonderful horses since she was born, but you only breed a Gelgelah once. And that is if you are extremely blessed. Tammam Albadeia by Simeon Sharav X Tamimat Albadeia. Credit Nasr. Nasr: I began to feel that I had achieved a level of success when I saw my horses incorporated into the breeding programmes of other farms. Also major wins at shows confirmed that what I was doing was on the right track. You must love the horse. You must love the horse. You must love the horse. You must be prepared to make many sacrifices. Breeding can take over a major portion of your life. It is literally 24/7 that you are involved. Financially, it is also a substantial commitment. You must learn and understand the functionality of the horse. This combines conformation, type, and the anatomical details. Study the breed. 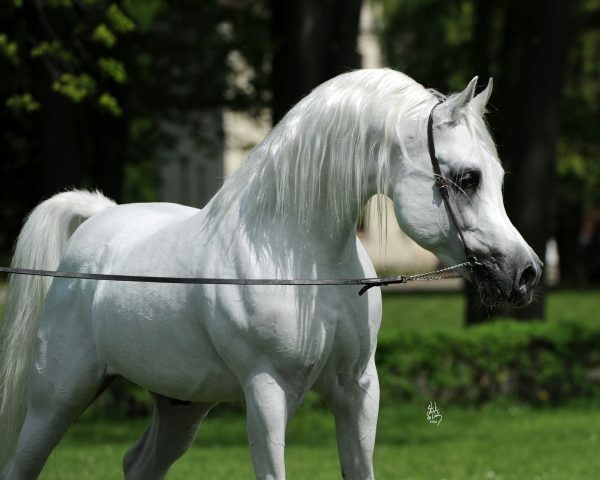 Learn about the various types of Arabian. Study the pedigrees and understand why each bloodline contributes particular characteristics to a foal. Learn why the various bloodlines do or do not work with each other. Study the individual horses. Do not rely on pedigrees only. Be truthful with yourself. Look at your horses objectively and take what everyone else says with a grain of salt. Do not convince yourself to do something only because someone says to do it. Evaluate carefully. Follow shows and results, but not blindly. Don’t forget there are trends in everything and you can get caught up by believing everything you are told. At the same time, learn from other breeders. Most have a philosophy. You can learn what works and doesn’t from their programmes. Attend workshops and seminars. Valuable information is always available. Never say you have the perfect horse. That creature does not exist. You can come close, but there is always something additional to be achieved. Most importantly, enjoy it all. In spite of the sacrifice and the time and financial commitment, it can be the most worthwhile thing you do. That is why we do it. Nasr: It is clear that the show world has changed dramatically over the past decade or so. There are so many more shows than before, and yet it has become prohibitively expensive to cover the costs of training and showing the horses. This has eliminated a number of the smaller farms from participating. Many of the older more established breeders also are facing this problem. It is important for the newer breeders to realise that, as with everything, the style changes. Through the years, we have seen the various bloodlines dominate the show-ring for a period of time. Polish horses have led at one point. So have Russian lines and the so-called ‘Golden Cross’. The straight Egyptians had their moment in the sun and we must not forget that Egyptian blood is in all of the others. There is always a temptation to follow the trend. 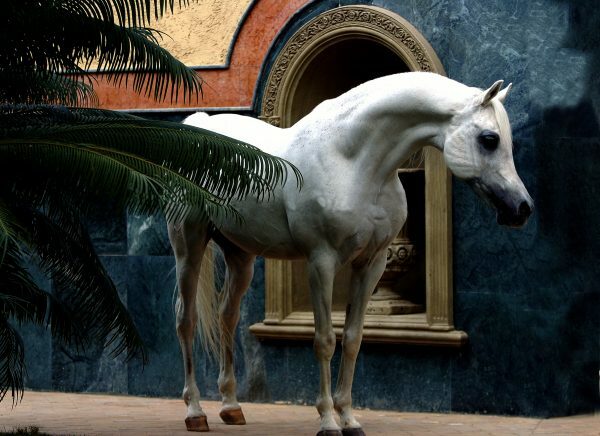 This has led, in some cases, to the lessening of the features of what we think of as the traditional Arabian. It is important to use the best of the various types while still maintaining what the world thinks of as ‘the Arabian horse’. We must remain true to what is sometimes described as the universal horse. This is why I stress that each breeder must understand why a horse moves as it does. One must know the reason for all of the features that make up the type and the conformation. A horse is not a photograph. It is a living functioning being. Breeding is not about only winning the cup. 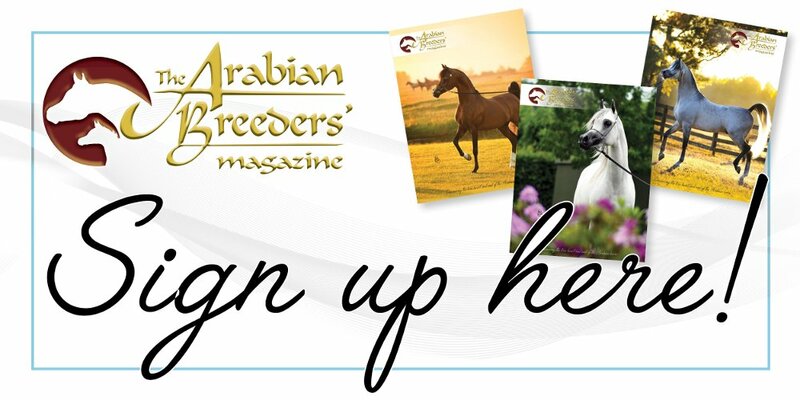 Nasr: Breeders are not a dying breed but true breeders are an endangered species. If we read my definition of a breeder in my previous answer, we see the amount of commitment and involvement is substantial. Breeding is not a hobby or a weekend pastime. It requires dedication, physical and intellectual discipline, and financial ability. In the beginning, breeders had this discipline. We only have to think of Ansata, Imperial, and Al Marah farms among others. These were people with vision who were trailblazers in the horse world. This kind of devotion is difficult to find these days so when we come across it, we must do everything to encourage it. Expenses of training and the show-ring, in addition to the basic costs of horse ownership, rule out many people who would otherwise want to breed and participate in the larger world of horses. It is a difficult career choice and does not produce results overnight. It takes generations of a breeding programme to see results. That is difficult for some to grasp in a world that is all about instant results. New breeders need to develop their own vision. They can take in the current trends and success stories but they must be true to their philosophy of breeding. We need to help and nurture those who genuinely are trying. Farid Albadeia (Ameer Albadeia x Farida). Credit Nasr. Nasr: I feel that every breeding programme must have a certain look, a recognisable stamp to their horses. This has been achieved at Albadeia throughout our 80 years. Of course, it is still constantly evolving. The changes have been gradual over the years and were always done with a look towards improving type, conformation and disposition of the horses. My horses must be harmonious, balanced, pretty to look at and move freely, with everything coming together to make that happen. 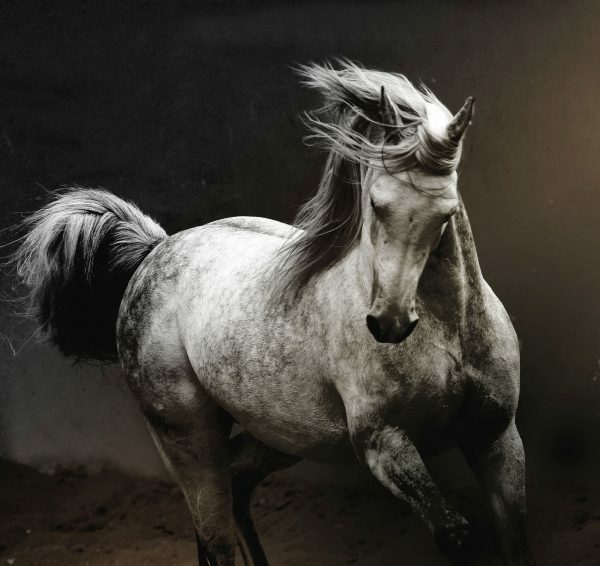 The goal of my breeding is to come close to the traditional or classic Arabian horse. It stands the test of time and continues to move people with its great beauty and charisma. The championships are important and they validate that my goals are recognised by my peers. But they are not the sole focus of my breeding. Nasr with precious mares at Albadeia Stud. Nasr: Hopefully, what is ahead for me is to continue what I have been doing. It has been tremendously rewarding, my life being filled with wonderful horses and wonderful people. I am hoping that my family will continue what those who went before us have tried to do. There is such a small gene pool for straight Egyptians that it puts some of us at a disadvantage in the immediate situation. However, fashions come and go. The quality is still with the straight Egyptian, so it is a question of carefully breeding it on. It is extremely difficult to breed a World Champion. I did it once with Gelgelah, but it is always a dream in the background of my mind. I will continue to breed what I believe captures the majesty and grace of the Egyptian horse, and enjoy that other people can respect and appreciate the horse. Our hope – to continue our successful breeding programme for the next years, stay healthy and enjoy our Arabians at home!